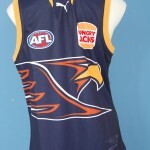 WCE , in a brilliant marketing coup , have presented the leader of the free world , President Obama with a personalised , West Coast Eagles, football jumper, jersey , guernsey . Julie Bishop , deputy leader of the Opposition , WCE board of director member , presented the delighted Obama with the footy jumper , prior to his address of federal parliament in Canberra . She likened the Eagles , to NFL side , the Pittsbugh Steelers , in describing their meteoric rise from bottom of the ladder , to finals contenders . 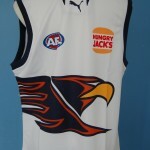 The other 17 clubs in the AFL Competition , will be disappointed they missed the opportunity to secure Obama's support . Obama , soared like an eagle , favouring the symbol of American democracy , and let the " dogs out ", ie: Western Bulldogs , Julia Gillard's team of choice. Will he sleep in his number1 , new football, jumper , jersey , guernsey ? 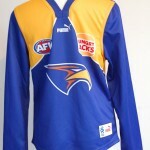 This entry was posted on Friday, November 18th, 2011 at 7:35 am	and is filed under AFL, football jumpers. You can follow any responses to this entry through the RSS 2.0 feed. Both comments and pings are currently closed.